Our team has the ability to provide typical distributor services for every day products and design assist services to complete larger system integrations. Learn more! A quality project from start to finish and afterwards is what Meyer customers receive and can continue to expect. NOTE: Pushback racking systems are engineered products that are quoted per application and may take time to adequately research for accuracy. 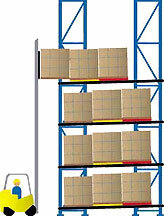 How Push Back Racking works:Pallets are placed by forklift on nested carts riding on inclined rails. Each pallet is then pushed back by subsequent pallet loading, exposing the next cart. When removing product, the forklift takes out the front pallet, allowing the pallets on carts behind it to roll gently to the front of the racking. The nested carts make placement and retrieval easy. A push back racking system fills the storage cube with product, not aisles. Instead of single pallet-deep selective racks, a pushback racking system lets you store pallets 2 to 5 deep while retaining easy access to a variety of different SKUs. Other basic Pallet Rack styles include: Selective Racks, Drive-In Racks, Drive-Through Racks, and Pallet Flow Racks. For more information, contact us by calling us at 800-899-1648. If you want the most rapid response to your questions, utilize our Push Back Rack Inquiry system.